Is there anything further from the robots and spaceships of VR games than a man in a cloak healing the sick and feeding the poor? Vive Studios doesn't think so. That's why it made its first 'feature-length' virtual reality film 7 Miracles,which has its premiere at Raindance Film Festival this week and will be released for all major VR headsets later in 2018. We tried it out on the standalone HTC Vive Focus headsets, sat in regular cinema seats at the Vue Piccadilly in London. We say feature length but in fact 7 Miracles consists of seven episodes, one per miracle, that can be viewed as standalone or as a whole 70 minute VR movie. It's essentially Jesus's origin story, with the plot focusing on the seven miracles that Jesus is said to have performed, as recounted by John in the New Testament. Plus there's one experimental, volumetric bonus scene that lets you move around in a cave via the play area mapped out by the Vive Focus' cameras. This earnest take on the Bible is a very unusual thing to see in VR – a scripted, live action period drama with all the sets and costumes that come with that and some quite cinematic scenes. You can see, though, how 'witnessing' the miracles of Jesus Christ in 360 degrees (turning water into wine etc) could be something like a religious experience to the right audience. Joel Breton, general manager for Vive Studios, says the idea for this particular story came before the push to make it feature length. "We knew that we wanted to make a faith based film because we knew we wanted to try to expand our audience," he says, "and there’s more than a billion Christians on the earth so that’s a pretty good sized audience. Part of the process behind coming up with this story was actually talking to some pastors, back home in the US, and one of the pastors had this sermon called the 7 Miracles of John and when he told me that idea, I just gelled on that as being the perfect thing for this film." Will it be enough? It's interesting to think about whether cinematic experiences like this could propel new groups of people to buy a VR headset, the same way high profile VR games could convince gamers to part with their cash. The fate of VR movies probably isn't going to rest on one man's shoulders, no matter how impressive his miracles. More likely, it will be part of an ever widening slate of VR films that are taken just as seriously as the games – Vive Studios is also looking at categories including education and healthcare. 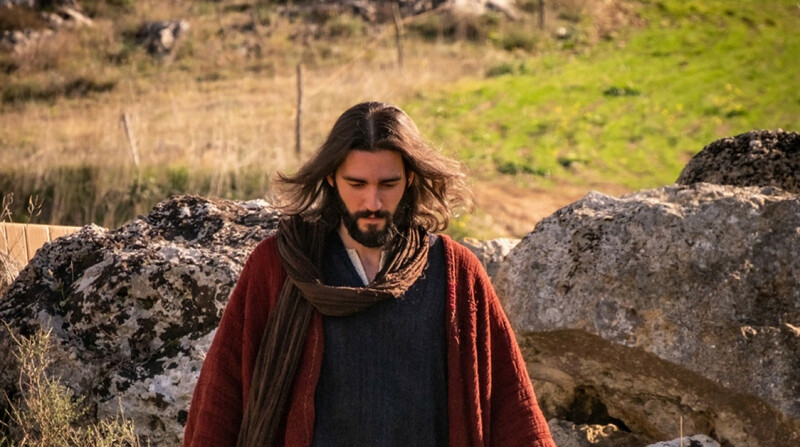 The team behind 7 Miracles includes director/producer Rodrigo Cerqueira, whose Jesus VR: The Story of Christ was at Venice Film Festival in 2016 and producer Enzo Sisti whose credits include The Passion Of The Christ, Wonder Woman and Avengers: Age Of Ultron. It was shot in Rome and Matera, southern Italy, the same location as The Passion Of The Christ. "When we started on this one, I didn’t want to make this kind of movie," says Sisti. "I wanted to stop on the big movies but now I'm continuing with VR. We had between 80 and 100 people on set and in terms of cost, it's more or less the same as a regular movie. Where we take advantage is the schedule – we shoot less days than a standard movie." Cerqueira says that 96% of the VR film was shot with the same View One Pro camera, with the GoPro Fusion used for scouting and that, for the seventh miracle, they mounted a 360 camera onto a drone. That also had an impact on Dejan Bucin who plays Jesus. He says that "it became clear to me that it’s closer to doing theatre than doing films. Because you don’t do the close up, you don’t have to be subtle, you can exaggerate movements and gestures. "Also sometimes in theatre you forget about the audience. Normally on sets, you have all this equipment and cameras, the sound guy holding microphone and here you just don’t have it, they all disappear. Sometimes I was Jesus for ten minutes with all these people reacting to me and then just one camera in the middle. That was very strange." You can see 7 Miracles as part of the VR selection at Raindance Film Festival, London until 7 October.